Hello! 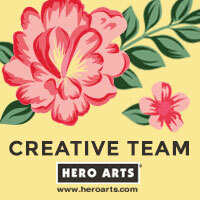 Today I've got a card to share using some newer Hero Arts products that I'm currently loving. I die cut the happy word four times and stacked them together to create a thicker embellishment. I colored the word "happy" with watercolor paints and white heat embossed the word "birthday". The flowers from the Stamp + Cut Flowers set are stamped with various colors of Memento Luxe pigment inks -- such gorgeous colors! And those tiny white dots were stamped with one of the images from the same set as the die. I find tiny filler images like dots and hearts to be so useful...they can really pull a card together! Also, I'm thrilled to be a guest over on the Simon Says Stamp blog today! Here's a peek at my card using lots of same products I mentioned above as well as some Simon Says Stamp dies. Beautiful card Kelly! Love the colour you chose for the die cut "happy"! Love your card. The colors are so pretty together. Very nice cards. I love the color combination! Love you card! The colors look awesome with the jraft paper! Love the colors and simplicity. Your work is so bright and cheery.